Just goes to show that diet food need not be blah=) The easiest trick to losing a few pounds is to drink lots of water in before and after every meal and in between. It makes you feel full and doctors say that most of our hunger pangs are often a sign of deyhdration. Wow, you lost 3pounds in a weeks time? I lost 7pounds in 4months aaargh! I would love to try this at home. I’ve been trying to lose extra pounds but am afflicted with “Marketmanila-syndrome” =)Difficult to do with all your pork-laden dish lately =)Thanks for all the good dishes you’ve been sharing and continue with your ad-free blogging. Makes reading a pleasure. Good luck with the diet, MM. Nibbling on dried nuts between meals can help reduce hunger pangs. Am watching your TV interview now here in Cebu!!! Artisan Chocolatier, what channel is it on? MM is this in preparation for the upcoming calorific Eyeball? hehehe then i think i better follow suit! I was going to comment on the one too many pork posts, although they did look utterly delicious. It is good to see results from your diet though, makes you keep on the good work! Still speaking of handling the volume, AleXenaâ€™s water diet trick with a meal involving spears of asparagus as in your top picture would definitely result in a long stream giving off a strong whiff of Gabriel Garcia Marquez. are your salads also available on the eyeball? :-)yummy!!!!! 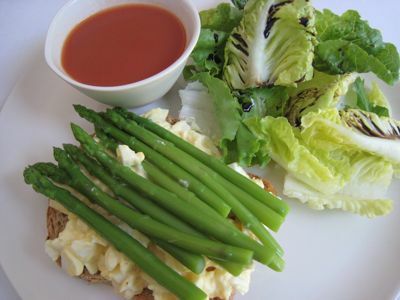 If you get hungry MM, try low fat cheese with celery sticks in between or green apples or low fat yogurt if available. ….they stay longer in your stomach with a delayed gastric emptying time. As for your diet coke, here is the contrabida again……..check your aspartame consumption, although I don’t sense any muddled thinking from your blogs yet….except, for not noticing how many successive pork postings you have done from your lechon “fixation” to pork chops in Turkey to the fat layered porchetta. Did I say I am jealous? Aspartame is not good for your central nervous system. I am noticing my husband getting slugggish with slow processing as in….”can you throw away the garbage?” A:” what garbage?”..”In the trash bin, my dear”……when he gets loads of aspartame from artificial sweeteners in his coffee. He drinks 3-4 mugs/day, the equivalent of 6-8 cups , perhaps even more when I am not looking. Haaaaay. Anyway, good luck on the diet! Presentation is half the battle. This was greatly espoused by the author of “French Women Don’t Get Fat.” She says make everything presentable and appetizing so you enjoy all aspects of your food including eating slowly to savour each bite. The asparagus looks so fresh. MM, if you are not on a diet, you should cook your asparagus in fat (preferably butter). 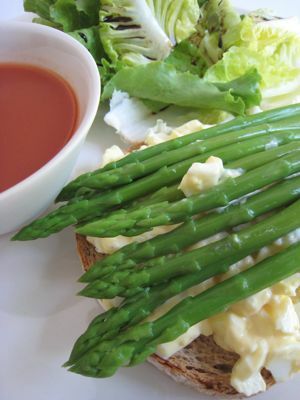 The flavor molecules of asparagus are water soluble so all the taste just gets thrown away with the blanching liquid. Or you can do some dagdag bawas with this recipe- just cook the asparagus in 1 tsp butter or olive oil, then omit the mayo altogether. To make everything moist and palatable, poach the egg until the yolks are warmed but still runny, sprinkle some sea salt and freshly cracked pepper… yum! And make sure to grill a piece of crusty bread to go with it. gosh, does that still qualify as diet food? I agree with Connie C on aspartame. Now either I use muscavado sugar, drink the “regular” version of Coke, Pepsi etc. or no sugar at all! MM you’re kidding with us, Right? I am curious… Do you prepare your own meals or do you already have a well trained cook that does these things for you including presentation? MM, here’s a diet recipe for you..
chicken breast thinly sliced about 1/2″ fillet. One half of a chicken breast is two portions. marinate for about 1 hr. then grill. half a cup plain yogurt or diet yogurt. 1 whole cucumber grated and strained to let the liquid drain. mixed and refrigerate to allow the flavors to meld. vidalia or sweet onions as much or as little as desired. chopped romaine with onion slivers and apple slices. cut grilled chicken and place on top..
drizzle with chunks of tzatziki sauce and splash with red wine vinegar. (don’t overdo with red wine vinegar it can overpower the dish. )The combination between red wine and tzatziki is very nice. lyna, I do many meals by myself and did this one totally by myself, except that one of the crew watched over the boiled eggs, which they now know how to do very well, and peeled the cooled eggs. Regina, not joking, though I will suffer this week as I am on a trip and I can’t stick to diets well during hotel buffets. chrisb, I completely agree with you on the butter and asparagus. As for the blanching, I try to keep it in the water for just seconds if possible. zena, I don’t normally make a big fuss over presentation, but I knew I was going to photograph this plate so a little extra effort went into the presentation. Connie C, diet coke was one one last food vice, unless pork is considered one, and I don’t smoke, only occasionally drink, so I figured some poison was okay. But after 10 days with an 80% cut-back in diet coke, I feel just about the same… siegrez, unfortunately, I find the lettuce selection in Cebu a bit disappointing. Though in the past year things have definitely improved. Will think about some greens for the eyeball as well… Apicio, hahaha, that’s practically the only thing I remember from that GGM book after all the thousands of diet cokes I have consumed since. FoodJunkie, if I lived in Greece, I think I would weigh 30 pounds more! mary joan, yes, I figured I should be in better eating shape for the eyeball and holidays. I usually do this, 2 months of torture for 10 months of pleasure… Artisan, what?! a replay I didn’t know about? Heehee. cumin, I have unsalted toasted cashew nuts from Palawan that I allow 10 pieces between meals if I get really hungry. Also low fat cheese. Or yogurt. And yes, I do have apples in the fridge which I understand have a low hypoglycemic? count. deidregurl, the first week is when you tend to lose the most, then it becomes harder to shed the remaining weight! AleXena, I agree, more water, it’s just so tasteless. So here is my trick and personal reward for dropping all the Diet coke. I drink huge glasses of water with lots of ice and 1 tablespoon or so of white grape juice with all of its natural sugar. The flavored water has say 20-30 calories but to me tastes like a treat. MM, I used to be a Coke addict–never drank water (except with medicines)–up until 1993 (94) while living in DC. What happened? I discovered flavored water (non carbonated) and caffeine free herbal tea, specifically the Celestial brand, which is available in Manila. I drink the tea hot or make iced tea with it. All natural, no sugar and (surprise) full of flavor. I have also learned to drink water and if I don’t (feel) like the taste/flavor of water, I add a slice of lemon or lime (apple, strawberry, banana) you get the drift. I read once, watermelon (juice) is a natural food for losing weight. i have been doing the water therapy for a year now…just like you, i find it tasteless, however, i developed the habit of putting 2 glasses at a time in the freezer and after 45 mins or an hour, the icicles it forms on the sides of the glass makes it so enjoyable to drink. i lost 15 lbs to date just by drinking 16-18 glasses a day…very little exercise pa yan. it also curbed my appetite and i tend to eat less. it works for me…alexena, you are definitely right, i go pee every 30 minutes or so. The water theraphy helped me loose some 50lbs 7years ago, although I gained almost 20lbs recently due to hormonal conditions. Doctors say drinking more water will help your body eliminate sodium, which contribute to fat disposition in the body. I love water but my weakness is powdered juice and now that I should cut back on sugar, be it white or brown, the dietician suggested that I take calamansi juice instead. But missing on sugar needs adjusting to. There are some flavored water in the market and the best to my liking is that of SUMMIT. Let me share to you what the dietician said about aspartame. In order for its adverse effects to be felt, you have to consume one whole box of artificial sweeteners in one sitting. For diabetics, artificial sweeteners are still the best rather than simple sugar of any form unless they experience low blood sugar. Jenny, sorry, I forgot to take a photo as I was nearly faint with hunger…. :) But if you know what a yolk with a green film looks like and you compare it to a “properly” boiled egg, you will see the difference instantly! Honestly, that looks like a great meal. And healthy, for a change. Hahaha! For a little variety, you could try a poached egg topped with a small spoonful of pesto on top of your asparagus and toasted bread. Small variation on the eggs benedict… Glad to see it’s whole wheat bread, though, and not white! Loved your TV appearance, BTW. Will be trying adobo cooked your way pretty soon. Zubuchon Pasalubong Center, Mactan — NOW OPEN!! !